As a child, John Bennet had no friends. So when his parents give him a teddy bear for Christmas, he knows he’s found a real friend. He makes a wish for his bear to be real – and it comes true! Ted becomes a worldwide sensation for a short while, but pretty soon, his celebrity wears off and he is just John’s best friend. Skip to thirty years later. 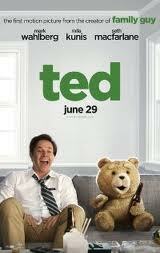 Ted and John spend their lives on the couch, smoking bongs. John works to live and has been dating the delightful Lori for three years. He’s stuck in arrested development, and things have to change. From Seth MacFarlane of Family Guy fame, you know this is not going to be an exercise in good taste and family fun. It’s crude, there’s lots of swearing and drug use. And it’s really, really funny. Which is a bit of a challenge; I’m not a fan of misogyny or racism, and so there are a couple of scenes which I reckon went a step too far, but that’s what MacFarlane made his name from. Why should I be prepared to accept it? I don’t know. I can’t explain it. It just really made me laugh lots, and sometimes that’s all it takes.